Quick Overview: Micro-computer controller,easy to change the speed. 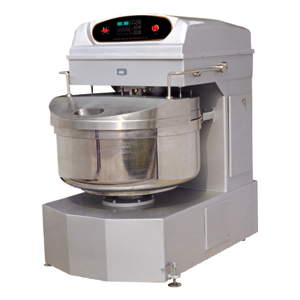 Heavy duty,the max kneading capacity mean the actual flour weight. More high efficieny. Mixers and bows can revolve simultaneously to increase mixing speed and improve the effect. Equipment with safety covers. The bowl and the part are made of stainless steel. The bowl can be easily taken out after press the touch-reverse, easily clean up. Specially designed spiral agitators along with the coordintating speed of rotation of bowl offer thebest kneating effect. Model HS80DA to HS200DA, the grid guard is made of stainless still, others is chroming. Powerful motor, make the flour mixed much more even.